Addons are.. the coolest part of SysReset in my opinion. 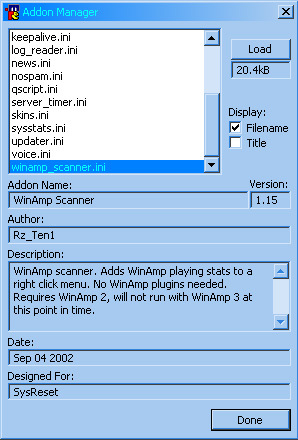 This is where all the good stuff is, like Winamp Scanner, System Statistics, Server Tracker and Browser.. etc. To activate Addons, click on SysReset, and select Addon Manager. When the Addon Manager pops up, there's a long list of addons. Most are useful, some are fun, but some serve absolutely no purpose at all. The addons I use consist of: winamp scanner, fserve tracker, fserve browser, @find, system stats, auto voice, keep alive, colors, and log reader. To load an Addon, single click on them, and click Load. To see their names, select "Title" instead of "Filename". Please use @find, I really love @find.. hehe. For a detailed description of each addon, single click them ad read where it says description. After each addon loads, you may find an extra menu to select when you click SysReset, or when you right click the channel. If anyone wants me to go into detail about a specific addon, contact me and I'll put out some information about that addon. The addons are pretty easy to figure out anyways, so try them out. Also, Server Tracker and Browser may seem a bit weird, but they're actually very very useful. Click on Server Tracker after u do a !List, and it will list all the file servers and tdcc's for you. Browser lets you use a file server in a windowsy way. Really cool.